Window and door systems are used for making aluminium window and door structures, which work well in practically any atmospheric conditions. Properly manufactured and mounted aluminium doors and windows are characterised by unique aesthetic qualities and very good thermal permeation and excellent acoustic insulation. 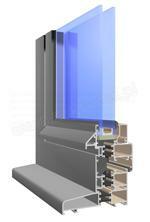 Aluminium windows and doors - quality and reliability. The condition for high quality aluminium window and door structures that we offer is application for their manufacturing proven during long-term operations in aluminium profile systems functional, durable and visually attractive hardware fittings, and the highest quality fillings that meet the requirements concerning safety, acoustic and thermal insulation. The efficient combination of these three components of window and door structures guarantees manufacturing of aluminium windows and doors that represent reliability, safety and high quality. Aluminium windows and doors - visual appeal and design. The aesthetic qualities of aluminium windows and doors are obtained mostly by taking care of structural details and a very wide range of varnish coatings. The most modern technologies of aluminium profile varnishing enable us to finish them in uniform colours under the RAL palette with various degree of lustre in colours with a visible structure and in wooden-like colours. Owing to a skilfully selected colour pattern at the design and pricing stages, aluminium window and door structures find their application both in modern, avant-garde blocks and classical residential buildings, and even in antique buildings requiring the most attention in adapting joinery to the character of a building. A very important role in shaping the design of aluminium windows and doors is played by structural and internal mullions introducing additional structural dividing lines in line with investors' expectations. Also, the shape and colour of hardware elements has a crucial impact on aesthetic qualities of windows and doors; handles, covers, knockers, hinges or the use of recently fashionable hidden hardware fittings. 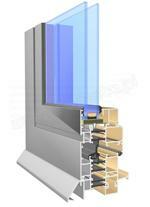 Aluminium windows and doors - physical properties. The most modern aluminium window and door systems allow us to manufacture windows and doors precisely adapted to various applications and detailed requirements within the scope set out in PN-EN 14351-1:2006. The essential features of aluminium windows and doors based on the standard are proper static properties, water tightness and air permeability. The other relevant performance characteristics are the level of safety, thermal insulation, acoustic insulation, and mechanical durability. For the most advanced window and door structures, we obtain mechanical resistance, resistance to burglary, smoke resistance, fire resistance and insulation. Aluminium windows and doors - functional properties. Functionality is a very important feature of aluminium window and door structures that allows them to be used in virtually every construction design and in meeting a user's requirements. The leading window and door systems on the market, in combination with properly selected hardware fittings, ensure various functions of windows and doors and types of their opening. Window structures are made as windows opened internally (side hung windows, tilting and sliding sashes, bottom hung casements), fixed windows opened outwards (opened outwards, bottom and top hung), sliding, pivot and lifting windows. Door structures are made in the form of doors opened outwards and inwards, sliding doors, pivot doors, balancing doors and lifting and sliding doors. 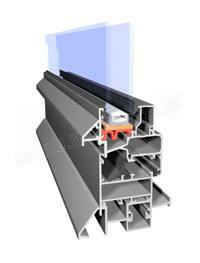 Essential systems used for pre-manufacturing window and door structures from aluminium profiles.